Everyone worth their time in fashion, or in reading the papers will have seen the lovely navy laced dress Kate, Duchess of Cambridge wore on her trip around Canada and the US. I wasn't sure what to be more jealous of, her dress of that Middleton derriere. The dress quickly sparked a phenomenon, the French Connection Anna Dress sold out in navy within days. 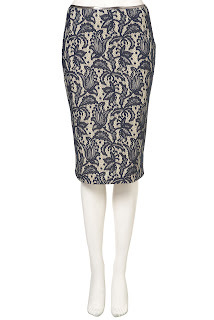 Luckily, the Topshop design team were watching too - and put the below skirt into action. 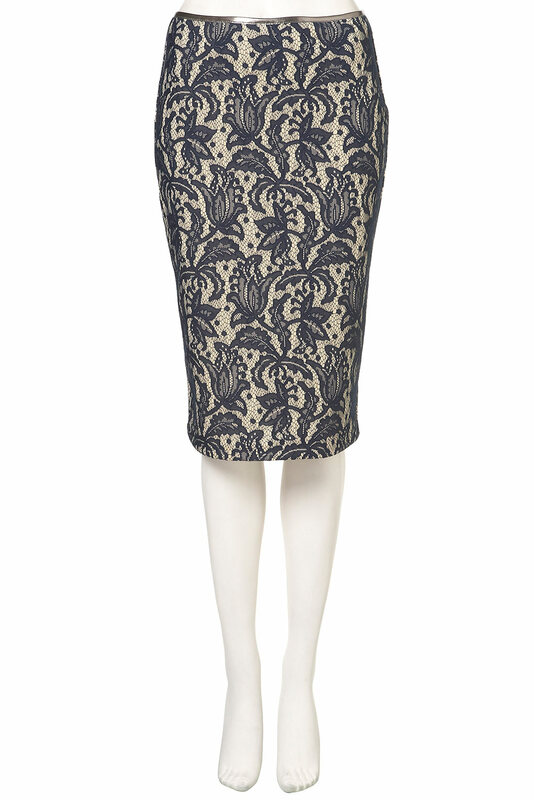 Beautifully combines the pencil skirt trend and the navy lace with cream silk. It's £40, so a littrle bit of a bargain. Admittedly not for every shape, but if you are comfortable enough with your waist size and your behind, this really is one of the best on the market right now (hunting down a red skirt I've seen from Mango that mirrors Christopher Kane too). As a general rule, the shorter you are, the higher the heel you need to wear a pencil skirt with. I'm 5 foot 3 and a quarter (the quarter is really important) so team them up with a proper stilettos and floaty blouse to contrast the top. Absolutely love this, it's a beauty. This is STUNNING! I need to get to Topshop ASAP!